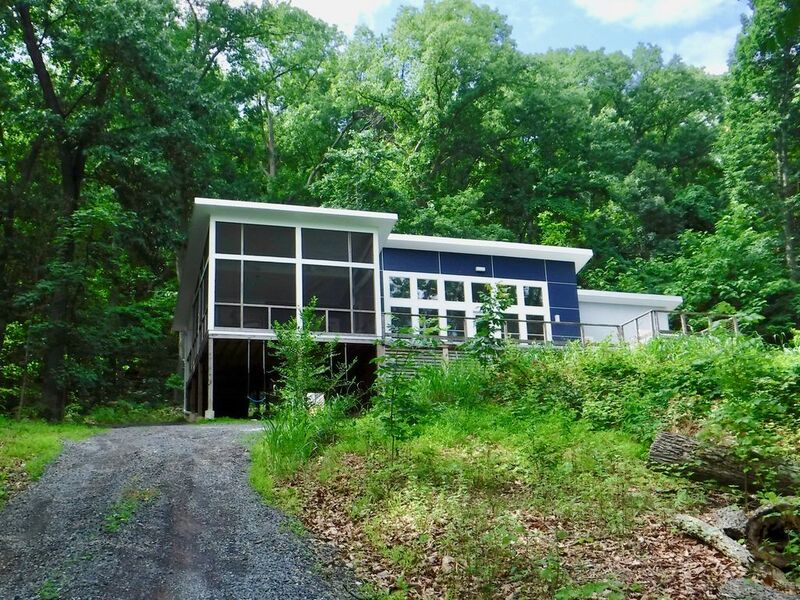 This is a one-of-a-kind, energy-efficient, simple yet luxurious home that offers a solitary and comfortable experience in a beautiful setting, the Shenandoah Mountains. Featured in the book THE FAMILY CABIN by Dale Mulfinger. The house has a great room, two conventional bedrooms (master with king bed and kids' room with bunk beds and crib), a den that converts to a semi-private bedroom (queen or two twins), two bathrooms (one with a soaking tub and one with double shower), and a gourmet kitchen. The house is filled with books, games, toys, movies, a Steinway piano—everything you'd want for a fun and relaxing getaway. We designed it with a toddler in mind, and it's very safe for kids. There's a secret playhouse with a play kitchen and art supplies. We've got air conditioning, a laundry room, and speedy internet. There are blackout shades in the kids' room but no shades in the master bedroom. We provide eye masks. Privacy is not an issue, and it's pitch black at night. Outside on our four acres there's a pool (open Memorial Day to Labor Day), large deck and screen porch, grill, fire pit (s'mores! ), archery equipment, lawn games, sand table, wild berries, occasional deer sightings, and invigorating walks (if you don't mind hills). The rolling green hills make the Shenandoah Valley one of the most beautiful areas in the mid-Atlantic. Five minutes away is a farm market with playground, BBQ, bakery, and ice cream; 15 minutes away is Strasburg, with antique stores and casual restaurants; 30 minutes away are Winchester, Front Royal, and the famous Skyline Drive in Shenandoah National Park. In the summer there's semi-pro baseball, drive-in movies, and river activities a short drive away. In the fall, the leaves are amazing, and the pick-your-own farms and markets are great fun. Spring is a great time to hike (including on the Appalachian Trail nearby), shop for antiques, and visit Civil War historical sites and caverns. Wineries have sprouted up all around. We are 90 minutes from D.C. and 2 hours from Baltimore. Nearest major airports are Dulles (75 miles), Reagan National (90 miles), and BWI (125 miles). The house has an uphill gravel driveway that is accessible with any vehicle, but you may prefer four-wheel drive. When you head home, you will need to toss your trash at the dump, an easy stop right on the way to the highway. Guests will have to sign a standard rental agreement. Check-in time is 4 p.m. and check-out time is 12 p.m., but there may be some flexibility—just ask ahead of time. The $60 pool cleaning fee will be refunded upon booking for guests who book outside of pool season. We are a professional couple with young son who lived in Washington, D.C., for a long time before moving to Seattle. Linda bought the house in 2003 as a weekend getaway from D.C. At the time it was a simple timber cabin. In 2009 construction was completed on the new house. We have a TV that does not have reception but can be used for streaming with your device via HDMI cable. An excellent collection of more than 100 movies. Aboveground pool with floaties and toys. Amazing modern cabin nestled in the hilltop near Shenandoah. Tall windows in the living room offer a spectacular view of the surrounding mountainside. Imagine drinking coffee in the AM with the fireplace, enjoying the view. Peaceful. The cabin is meticulous with a top-notch kitchen to stay in and cook. Archery is available and fun for both kids and adults. Kaye, the property manager, is extremely responsive and will come over quickly if anything is wrong. We couldn't get the fireplace to light but she came over in a few minutes and showed us how to use it. The location is great, close to Strasburg, Front Royal, and about a 20-25 minute drive to Shendandoah's north entrance on Skyline Drive.Thank you for a wonderful weekend. This is a fantastic vacation home with a great kitchen. This house was also perfectly set up for families with young kids. There is even a playroom. The house is about a half hour from the north entrance to Shenandoah Valley National Park in Front Royal. We loved it and so did our 1 yr old! Gorgeous house, with tons to do. We were also able to relax because our 1 yr old had so many fun toys to play with. house is extremely kid friendly. we had cool weather (for August) and enjoyed meals on the screen porch, and our daughter loved the playroom, and crawling all over. Kaye and Linda were great hosts. I want to come back every weekend! We loved our stay! The property is so welcoming with many household staples provided. Our kids absolutely loved the hideaway art room while we had at a great time with the archery. The fire pit on the patio was a real highlight, we loved sitting around the fire in our private forest. There were dark shades in the kids bedroom which was an obvious plus. I feel like every review must mention the driveway :). Kaye encouraging our first drive up was so helpful. After the first time, I think we got the hang of it, which is to make sure your wheels are completely straightened before accelerating up each incline. I’d probably say driving the driveway in the dark might be very challenging and probably for someone very adventurous; we have a 2 wheel drive minivan and were able to manage the driveway just fine. Overall, the house is exactly like you see in the pictures, it’s bright, open, clean and a very enjoyable place to visit. We stayed here with our 3 young children (4, 3, & 1). This house is amazing. We made such wonderful memories and really got a chance to relax and enjoy our time here. The house is super clean and so well equipped with everything you could need from laundry detergent to children's Tylenol! Our kids loved playing with the toys and games , swimming in the pool, swinging, and getting a chance to watch movies like Toy Story for the first time. Linda and Kaye were so responsive and nice to communicate with . It will be tough for us to top this house for any future vacations!! Used your place as a home base during a long getaway golf weekend. Centrally located for most Shenandoah Valley golf courses, this home was perfect for our use, and made our stay comfortable, relaxing and FUN. Some of us may even go back with our family at a future date. I definitely recommend this house. Check-in time is 3 p.m. and check-out time is 12 p.m.—but there may be flexibility. Just ask!